In this example, there is no more space available on the file /vmfs/volumes/56f4ed2a-0bf6918c-5298-10bf4879952f/CentOS-FS1_2/CentOS-FS1_2_3-000001.vmdk, preventing the virtual machine from booting. Determine the disk the file is on. In this example, the file is on the disk named Seagate 2 TB (2). In the Datastore, we can see that the storage drive has 0.00 GB free. A common solution to this issue is to revert to a prior Snapshot. 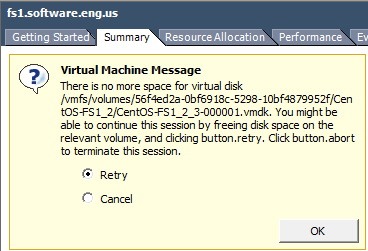 It is also a good idea to follow the instructions in the tutorial on how to ensure a VMWare datastore never runs out of free space.